As a family living the "Weekender" RVing Lifestyle, though we want to go and play as many weekends in our RV as possible, some we have to stay put and do the maintaining of our home away from home. We've noticed that over the past ten years the top stripe decal on RoadAbode has become very worn looking. Faded and cracked, it really takes away from how the rest of RoadAbode's exterior looks. 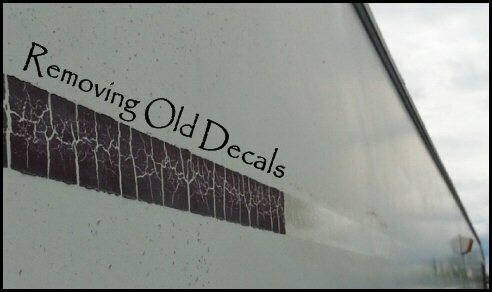 The other decals are in good condition, and have few crazing marks or dullness. We decided that for this season removing the stripe would be the best option. We can decide later if we want to replace it, do a different type decal, or leave the area blank. Over the winter I had done plenty of research, both on RV forums and various blogs and YouTube Channels. There were plenty of people with opinions how to remove the decals. Using a heat gun. 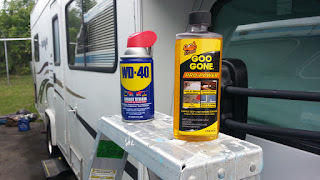 Using WD-40 to soak the decal. Using turpentine to rub on the decal. Using a scraper after soaking and rubbing.. The best information - both concise and with tips on "what they'd do differently," came from a video posted by full timers Laura and Sasha. Though they were removing all the decals from their fifth-wheel, the information they shared still made the process completed on RoadAbode much easier. I modified my process compared to how Laura and Sasha worked slightly. 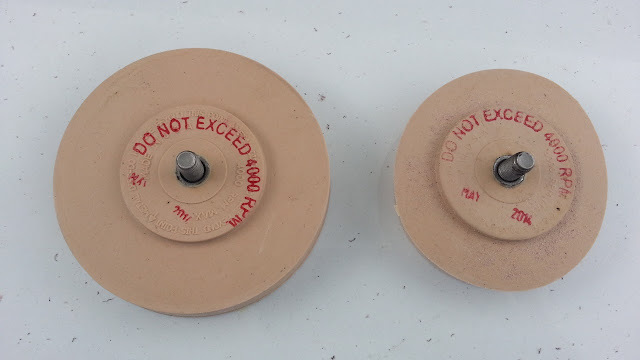 The eraser wheels Sasha used were by 3M. Each wheel cost between $25 and $30 dollars. In part of the video, Sasha mentioned that he had seen a less expensive, off brand wheel online that might have done the job just as well. A quick search on Amazon and I found the wheels he meant - six eraser wheels including a drill adapter for $50 including shipping. I ordered a set. 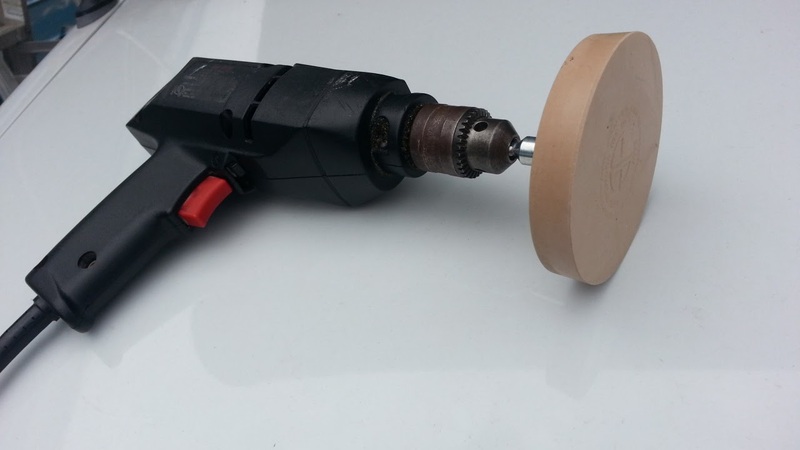 The next great tip Sasha mentioned was to use an electric, plugged in drill for doing the majority of the work with the eraser wheel. The constant running of the drill at high speed just wore out the batteries too quickly on the cordless he had. I had an old Craftsman power drill that was up to the challenge. One thing that concerned me but was unfounded was the bit that screwed into the back of the eraser wheels was fairly smooth where the drill chuck gripped it. It never was an issue. I also brought along WD-40 and Goo-Gone Cleaner. Neither was needed. The only other tools I used were some rags to dust off the "eraser shavings" from the sidewalls and my five foot ladder from home. RoadAbode's extendable ladder leaned against RoadAbode would have worked, but I would have been working more closely to the sidewall, with less room. Before I forget, I did use safety goggles to keep the eraser shavings out of my eyes, and a pair of leather work gloves I use on jobs like this because I always forget and grab the drill too close to the chuck. On Sasha's suggestion, I wore my oldest jeans and workshirt - and glad I did. It wasn't all that "dirty" but a combination of rubbery grit and dust. By the time I was done I felt like a whole elementary school had saved up all the eraser shavings from a years worth of figuring out math problems and dumped it on me. I was thankful I wore a long sleeve shirt - it kept a good bit of the stuff away from my skin. I even wore some older (but sturdy) boots I had at home. One think I could have used was maybe a dust mask to filter some of the shavings. It wasn't really fine dust, but pretty sure I'll be blowing my nose to get eraser stuff out for a few more days. Removing the stripe was not as bad as expected. I thought that it would take two or more full days to get the job done. I expected little bits and pieces of the decal to stubbornly stick on, but there was no issue. The stripe on both sides and back of RoadAbode came off in about four hours. I wasn't rushing and took my share of water breaks too. I noticed that when I first started using the wheel some of the color of the stripe would get smeared and be difficult to remove. It seemed to be from a coating on the wheel itself, perhaps to seal the rubber wheel and give it a longer shelf life. Once that was gone, the stripe really just started disappearing. I tried to keep the whole edge of the wheel evenly against the side of RoadAbode. I remembered that Sasha had problems keeping the wheel wearing evenly. I had finished one side and was half way through the second when the drill was getting really hard to control. The Wheel was out of round. Rather than get hurt trying to work with the half used eraser, I switched it out. Made the work go way easier - and quicker. In relation to other jobs I've done on RoadAbode, this job went pretty well. I did only use two eraser wheels, but already am thinking of removing "Petey," Coachman's Dalmatian mascot on the front cap and rear of RoadAbode. Petey is the only other decal that looks worn around the edges. If you have any questions or want to share how you've removed decals, let us know in the comments section below. See you on the road!